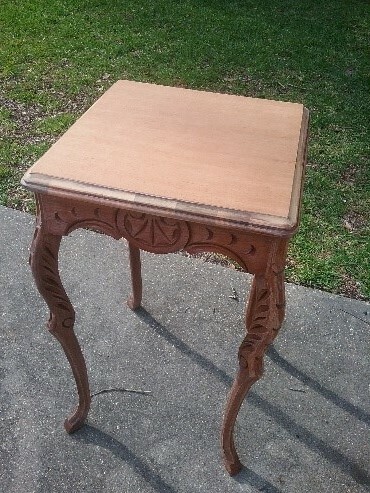 This little table had been stored away for years. 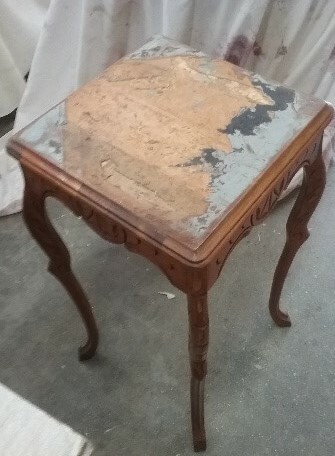 It had badly damaged veneer on the top that gave an uneven surface. 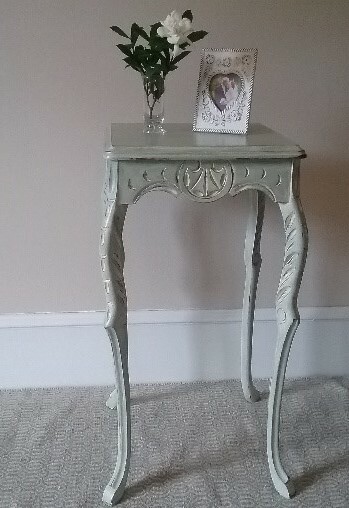 Our client wanted to use the table again so called us in to see what we could do. Dewey was keen to apply new veneer to the surface and then finish this in a natural wood finish but was, well outvoted! There were some very pretty carvings on the legs which would really look good when shabby chic'd. 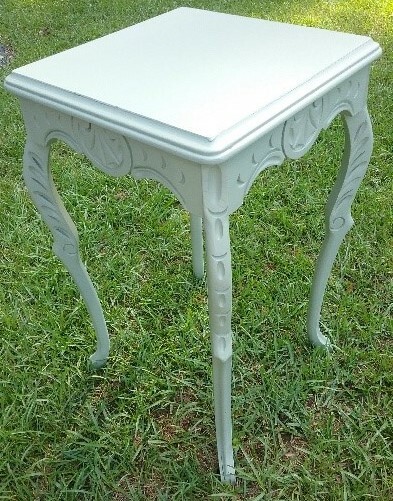 Our client wanted soft green which was a little bit different to our normal off white and grey color scheme but I was keen to step outside my comfort zone and give it a go. One the repairs were finished it was time for me to get my paint brush out. 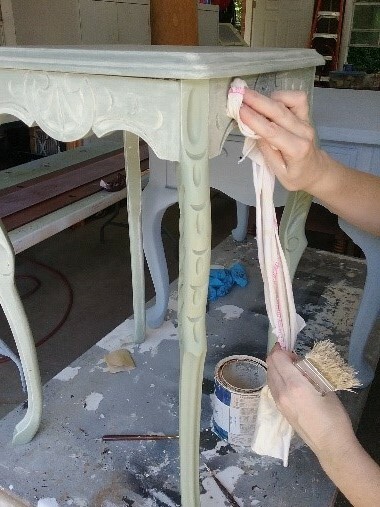 We cleaned the table, gave it a quick sanding before painting in a pastel green base coat. After letting this I dry it was time to get creative! Using an off white paint I dry brushed this onto the green, quickly wiping the paint off to give a very soft 'blurred' effect with the brush marks blended in gently. 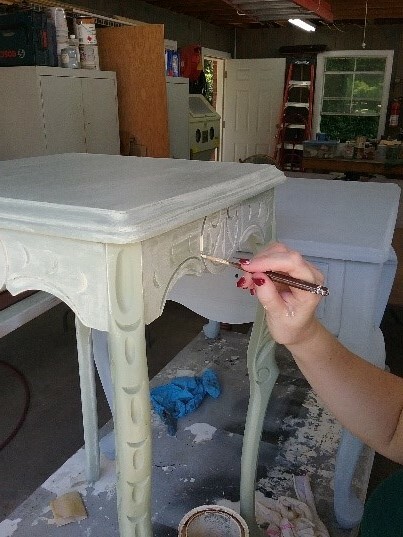 I had to work quickly and on small areas at a time, because the paint was drying quickly in the Louisiana heat. With the moon-shaped and scalloped carvings I went over these using a small brush to make sure the lighter paint covered those areas well. 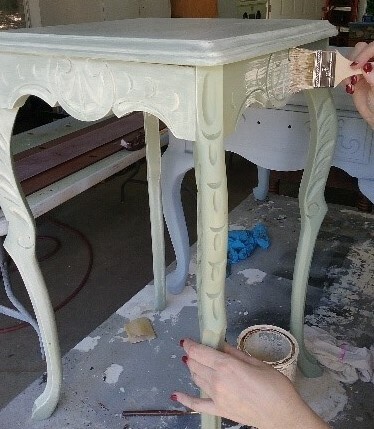 I then let the paint completely dry overnight before very gently distressing. I wanted to highlight the carvings and so gently sanded the edges around these areas to reveal the wood underneath. 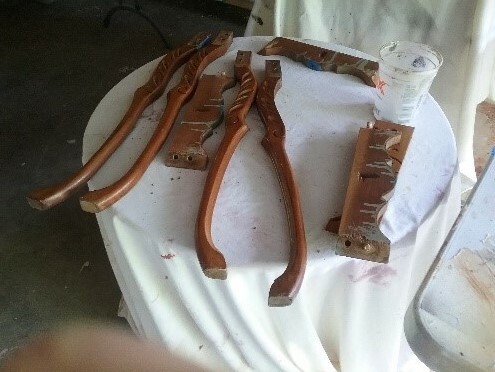 I also distressed the legs on areas where they would have received knocks and wear over the years. Once satisfied we sealed the table with a coat of laquer to give it a coating that would withstand modern use.